Socialising your puppy is an important part of their training and development. Socialisation means learning to be part of society. When we talk about socialising puppies, we’re talking about helping them learn to be comfortable as a pet and human companion within human society— a society that includes many different types of people, environments, buildings, sights, noises, smells, animals and other dogs. Extensive socialisation instils resilience in your puppy. As they grow up, this means that when the environment around them changes, they can cope because they are comfortable with things changing all the time. Socialisation is not just introducing other dogs. Thorough socialisation is about includes people, objects, noises, surfaces, anything your dog will encounter in its life. So be creative! Feed them from different bowls, walk them on different surfaces, expose them to different noises, introduce them to different types of people. You want to get started with puppy socialisation from an early age. Puppies are most accepting of new experiences between 3 and 12 weeks old. After that age, they become more cautious of anything they haven’t yet encountered. Depending on individual puppies, from between 12 to 18 weeks old the opportunity to easily socialise the puppy ends — the average is 16 weeks. With each passing week after this it becomes harder to get the pup to accept and enjoy something that he’s initially wary of. It can be extremely difficult, and sometimes impossible, to teach an older dog to like something new, or help him become comfortable with something they find frightening. We’ve put together a checklist to help get you started. 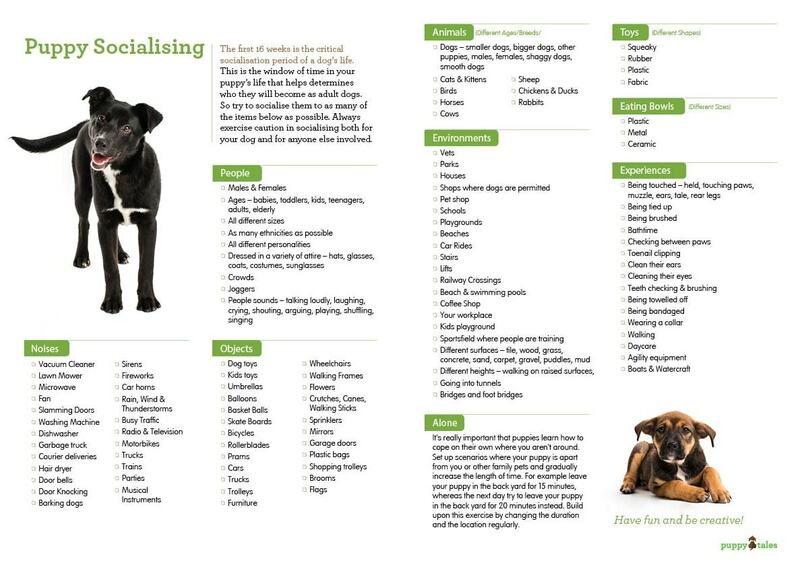 You may not be able to socialise them as a puppy to everything on this list, but why not make it a challenge to see just how many you can check off?